Magnetic Resonance Imaging (MRI) is gaining interest in radiation therapy (RT) with the emerging development of advanced high precision treatment techniques such as intensity-modulated RT (IMRT) and volumetric intensity modulated arc therapy (VMAT). These techniques require accurate anatomical imaging to avoid irradiation of surrounding healthy tissue. MRI has a superior soft tissue contrast compared to the golden standard of computed tomography (CT), which makes it possible to define tumors and surrounding healthy tissue with greater accuracy. MRI may also provide functional information such as perfusion and diffusion of the tumor. Finally, because of the absence of ionizing radiation, the patient may be scanned a number of times before, during and after treatment without detrimental consequences. However, CT imaging remains an important aspect because of the required CT-based electron density. The use of CT-MR fusion requires geometrically accurate MRI datasets. Therefore patient positioning on the MRI scanner has to be identical to patient positioning on the CT scanner. Orfit offers dedicated MRI compatible head & neck immobilization systems for Siemens, Philips and GE MRI scanners which allow you to use Orfit thermoplastic masks to assure that imaging is performed in exactly the same position as for simulation and treatment. The Orfit MRI-S solutions consists of a High Precision (HP) base plate, a bi-lateral coil holder, a set of six HP headrests and a set of couch top fixations for the Siemens MAGNETOM® family of MRI scanners. The MRI-P (Philips) and MRI-G (GE) solution comprise a base plate, a set of six HP headrests and fixation devices. 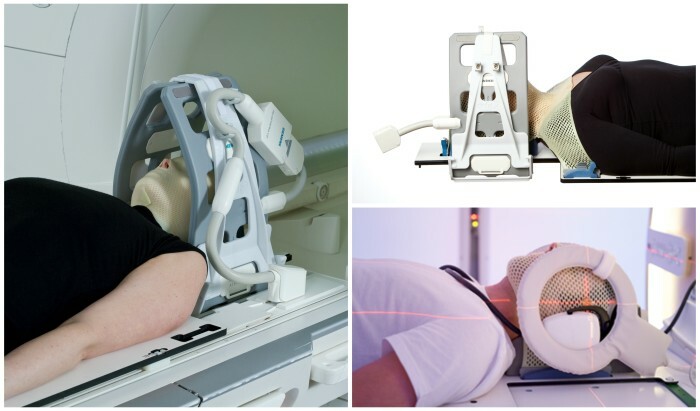 The flex coil mounting systems are part of the Philips and GE MRI scanners. More information about the use of MRI in radiation therapy can be found in the Siemens Magazine: MReading: MR in RT – Contributes from our Magnetom Users.